It's Vitamin D Awareness Week! It is estimated that 10 million people across the UK – that’s one in five adults and one in six children suffer from low levels of vitamin D. The Scientific Advisory Committee on Nutrition (SACN) guidelines now suggest that everyone should supplement vitamin D (at least 400IU) during autumn and winter. At risk groups are advised the supplement all year round. Signs of vitamin D deficiency can manifest in common health conditions such as constant coughs and colds, tiredness and fatigue, seasonal affective disorder, poor bone and tooth health and low mood. A study published in The Nutritional Journal  showed that vitamin absorption via an oral spray is 2.5 times more effective than vitamin capsules. 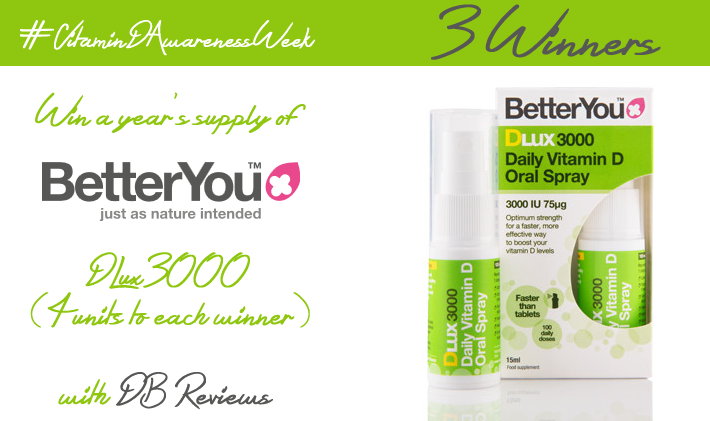 Easy to use on the go and not dependent on food or water, BetterYou DLux oral sprays are fast-absorbing and are suitable for the whole family. DLux3000 is an optimum strength daily oral vitamin D spray. Specially formulated to deliver vitamin D directly into the bloodstream bypassing the digestive system. And here is your chance to win a year's supply of the DLux3000 oral spray (which is 4 units to each winner). Just enter using the Gleam widget below. And some more good news - there will be 3 lucky winners, thanks to BetterYou. The DLux range is available from Holland & Barratt, all good health food stockists and online at www.betteryou.com.